It started when my wife and I decided we wanted to take a look at Rice University, and the little chapel where we were married back in 1983. It’s been 29 years and some change so far, and by December 17 on 2013 we’ll have been married 30 years. So we drove out of northwest Louisiana, where we go for Christmas, and where my dad stays, and headed south. We used a GPS, as I wasn’t familiar with the roads. Highway 59, which forms most of the path south, is a lot wider and a better road than the one I remembered. It’s also a faster trip, closer to 4 hours than the 5 to 5 and a half I used to remember. Once we toured the University, we looked in the “Village” district for landmarks we remembered. Almost none remain from my time in Houston, but this one immediately caught our eye. 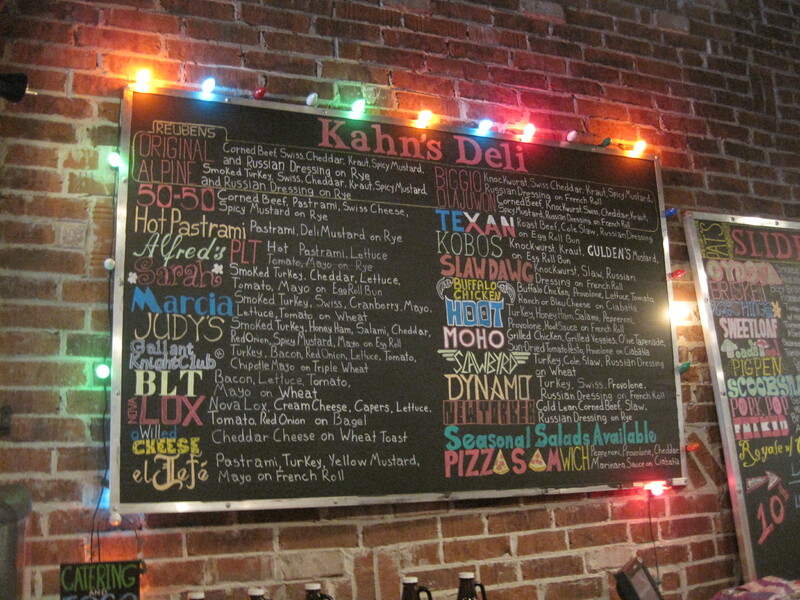 Kahn’s deli, in its first incarnation, appeared in the 1980s, with Mike Kahn as its owner. 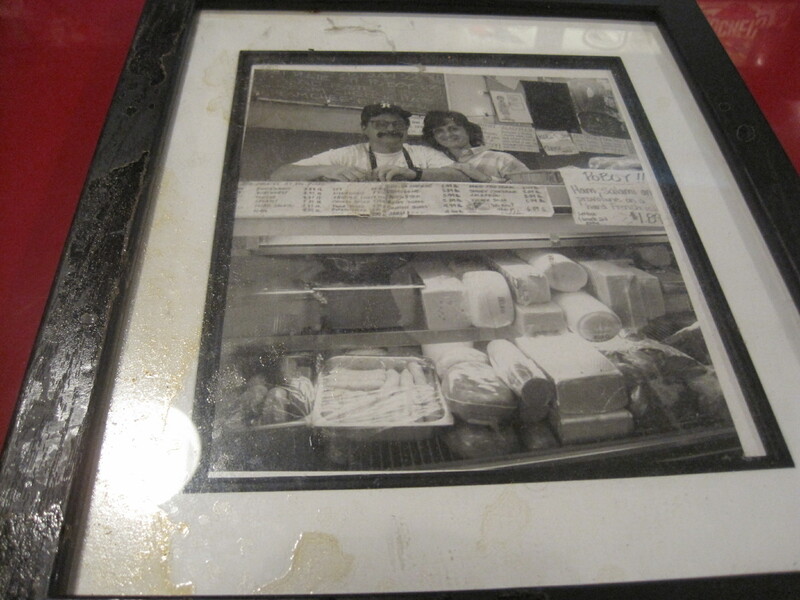 The new owners (version 3) were nice enough to pull out some photos and chat up the past of the restaurant. The original owner, Mike Kahn. The walls are new, as owner #2 imported the brick from New York City. 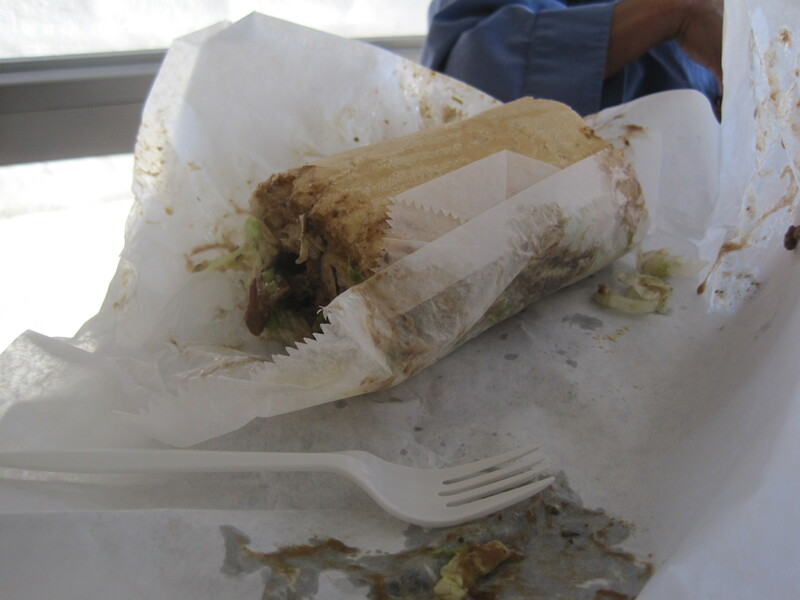 At this point, the emphasis is to recapture the taste of the original deli, as the folks I spoke to told me they ran every recipe through Mike, to see that it met his standards. 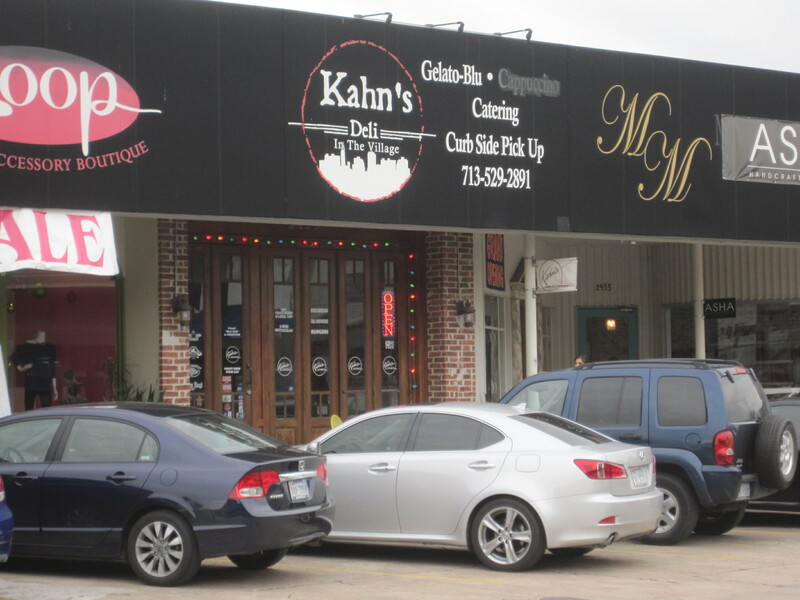 I didn’t eat at Kahn’s when we were there, but I loved it back in the day. It’s one of the few holdovers in the Village from older times. 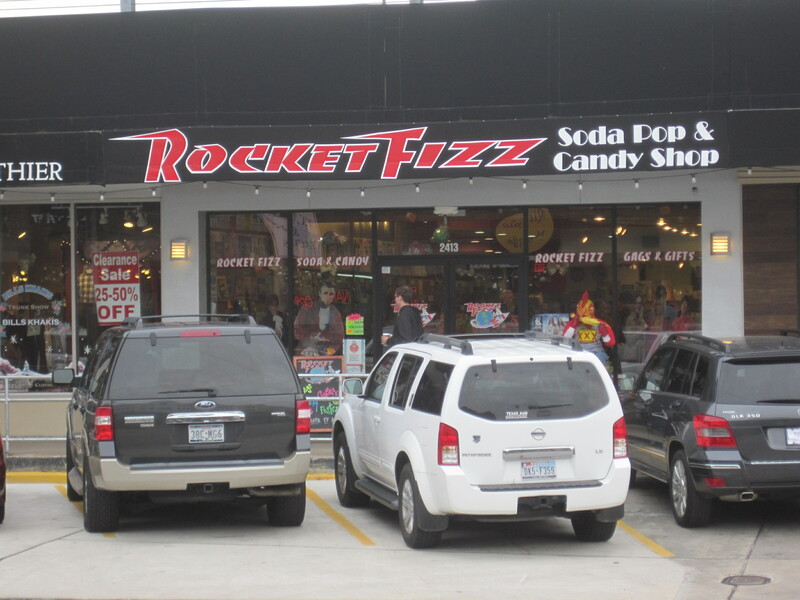 While I chatted up Kahn’s, my wife and daughter found this place and bought plenty of sweets. Afterwards, I couldn’t talk my family into Kahn’s, but another old time restaurant did gain their approval. 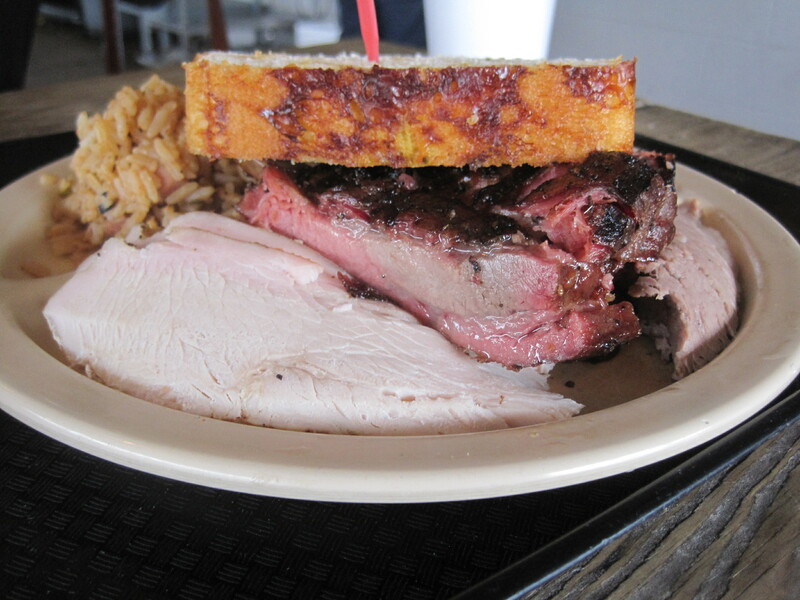 Goode Company Barbecue was ranked as perhaps the best Houston BBQ back in the 1980s. With barbecue culture growing, and the ever growing emphasis on smoked meats, barbecue gurus such as Full Custom Gospel Barbecue* no longer rate it as Houston’s best, but certainly good, and further, accessibility and the ease with which they serve food keep it popular (A #1 Urbanspoon ranking in Houston in the barbecue category, as I write this). It is an easy place to get into and get out of, even if the parking is limited. We were eating roughly around 4 on a Sunday, so we didn’t have a lot of competition for the few parking spaces in front. 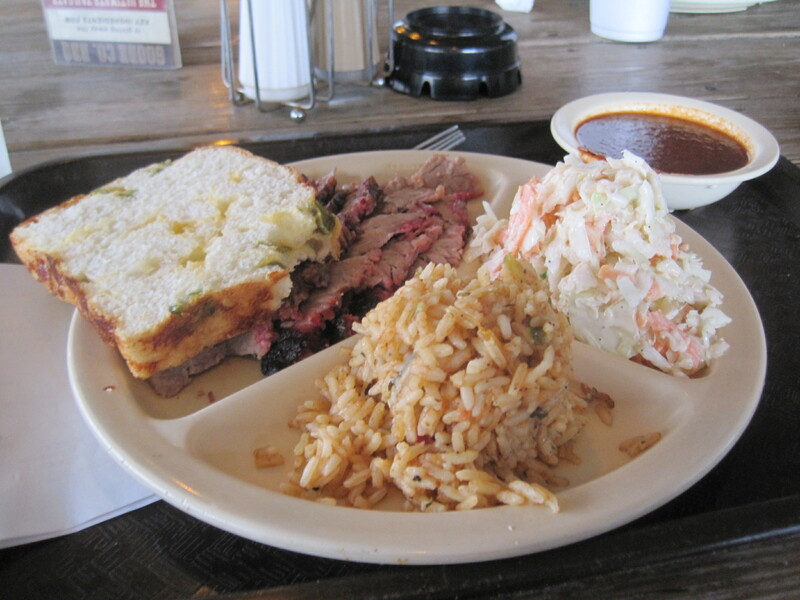 beef brisket, slaw, Goode Company’s take on jambalaya. Ribs and turkey. The one rib I tried was excellent. 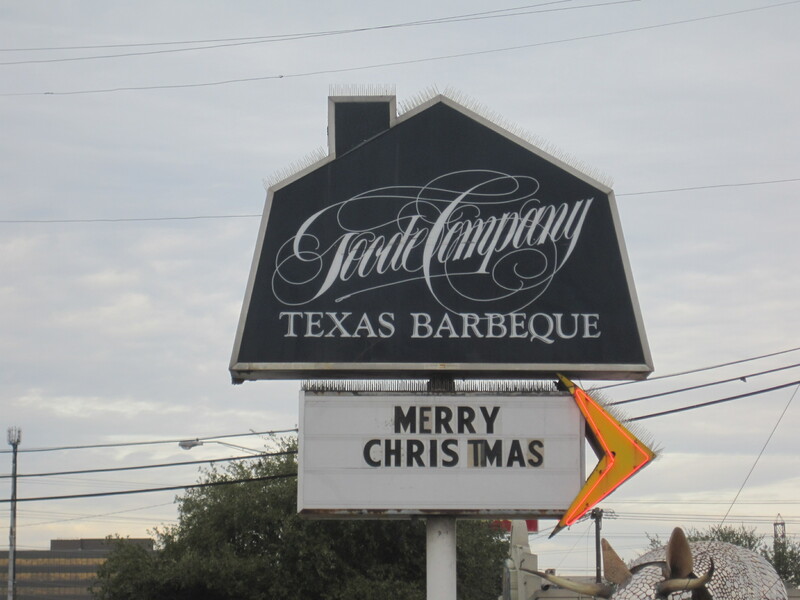 We tried Goode Company’s turkey, their brisket, their ribs and their sausage. In our hands the meats were real barbecue, clearly smoked, but at times a little underwhelming. The brisket was a bit disappointing, the ribs were very good, the turkey and sausage satisfied our eaters. 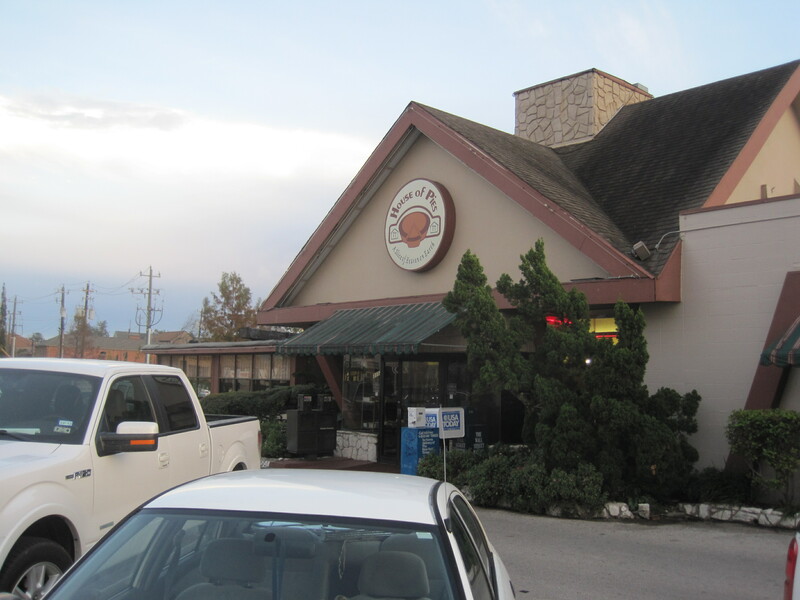 If Goode Company were to be pulled out of Houston and dropped into Atlanta, I don’t think it would rank up with smokehouses like Fox Brothers, or Heirloom BBQ, or say Big Shanty Smokehouse. It would be in the second tier of barbecue restaurants, a bit like Spiced Right, owner #2, on a good day. 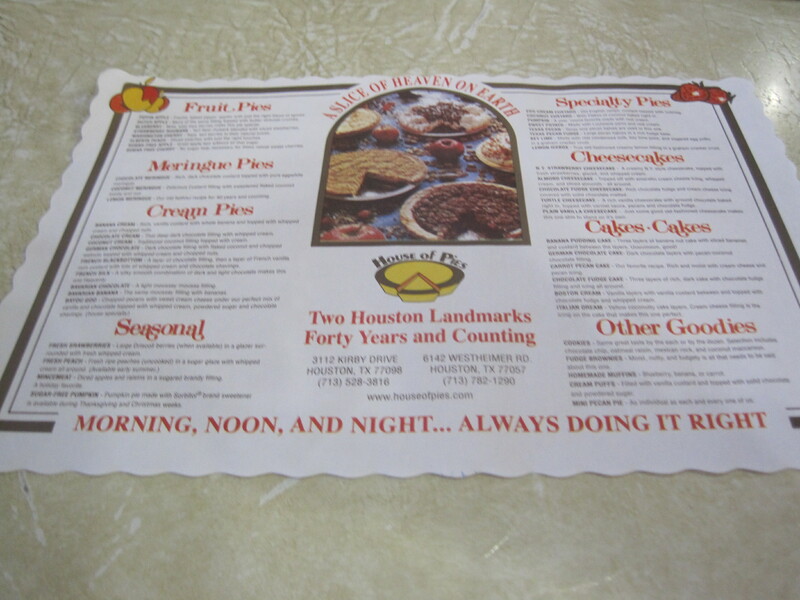 So, after Goode Company we went on to the House of Pies. 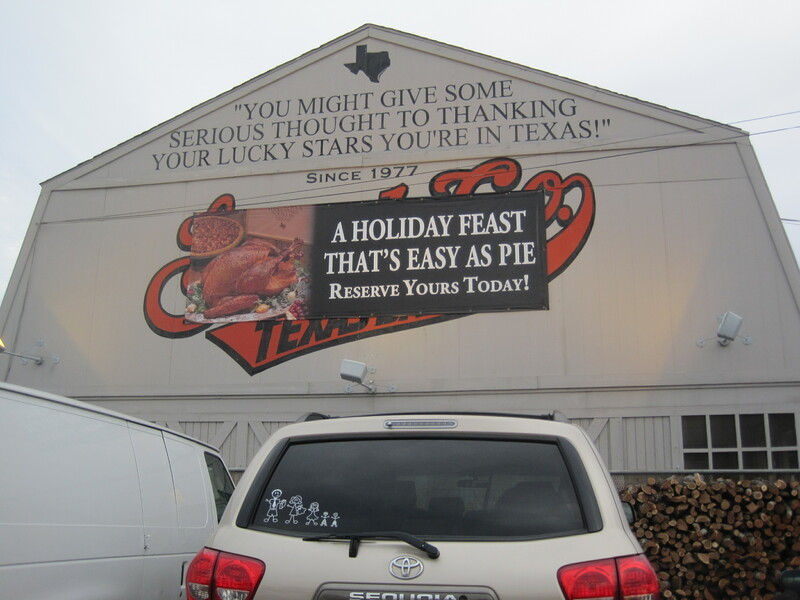 Despite what others might think, this place is about the pies and only about the pies. This is a long time favorite midnight and later eatery. The exotic crowds you would see at this place around 2am made it something of a legend in these parts. A good portion of the late nighters were people from the Montrose district (Houston’s equivalent of San Francisco’s Castro Street), which led to some politically incorrect names back in the day. Somehow, it just seemed tamer. 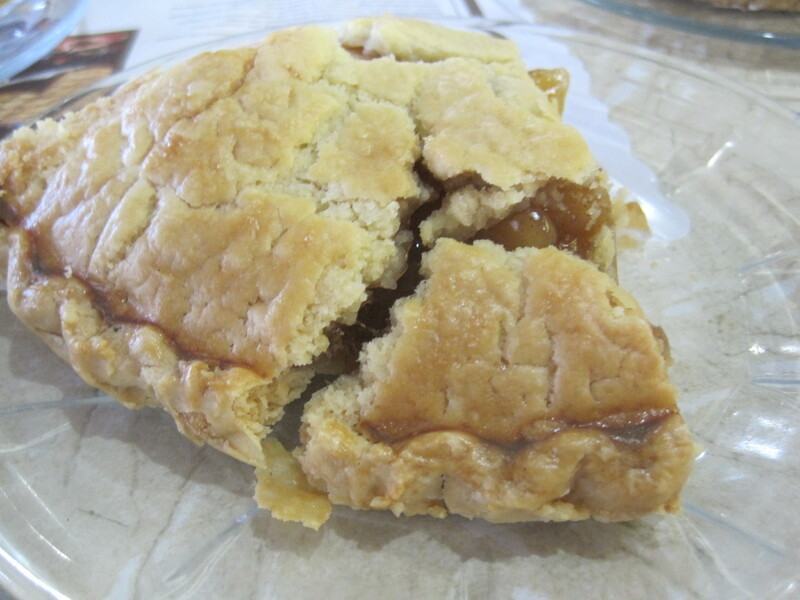 The apple pie, while good, didn’t seem as big as we remembered. I recall an apple pie that was a fist and a half tall in the middle. Is my memory playing tricks on me? perhaps. However, the French Blackbottom was still there, and diabetes or no, I had a bite of this one. 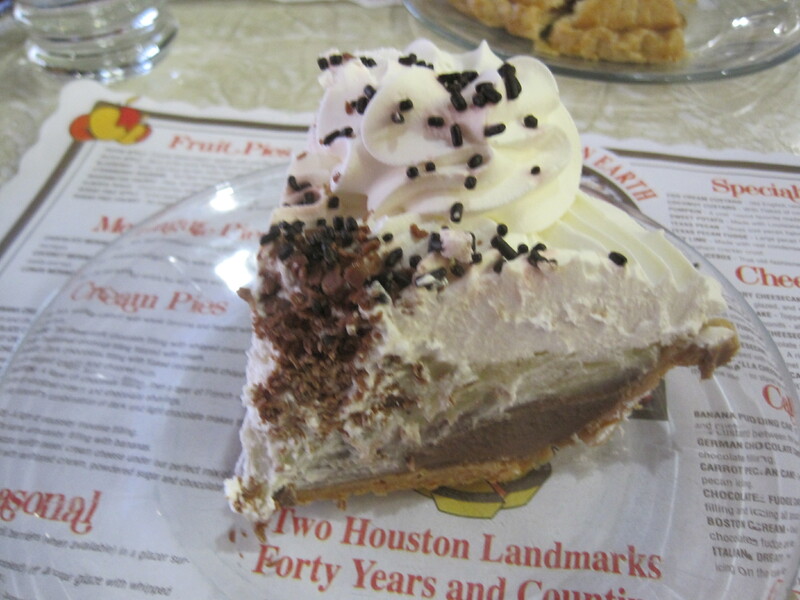 The best of the pies may have been the Bayou Goo. 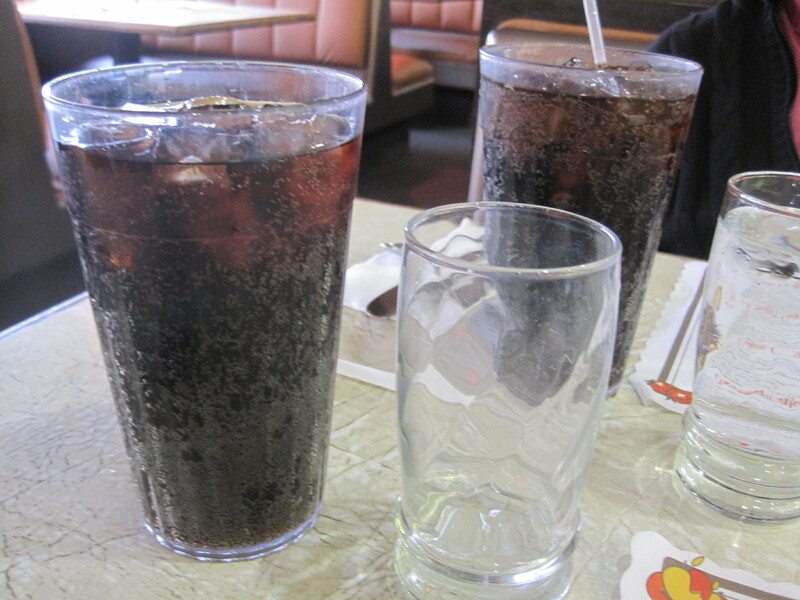 Sodas at House of Pies are huge. French Blackbottom. In the 1980s, my favorite pie from this eatery. The apple pie seemed so modest. Were our memories playing tricks on us? 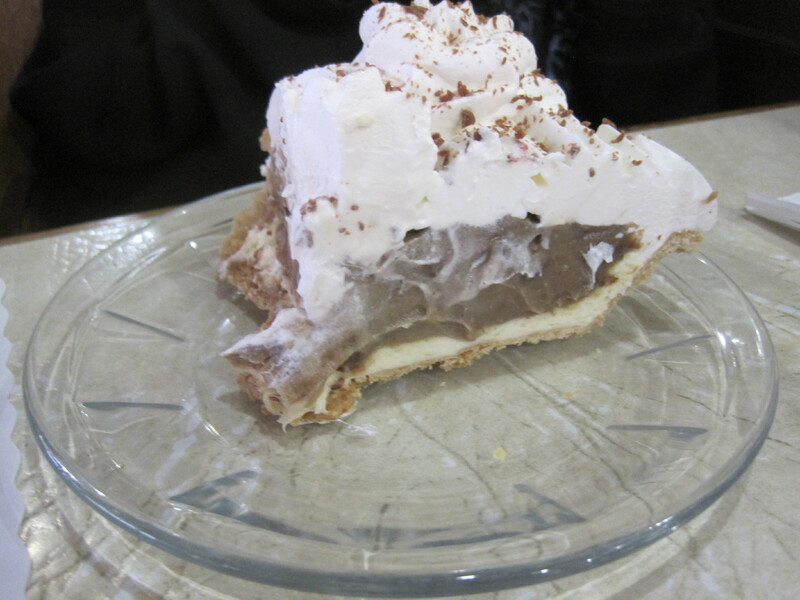 Favorite pie this day was the “Bayou Goo”. After, my wife threw out a shocker, and said we should start driving east right then. 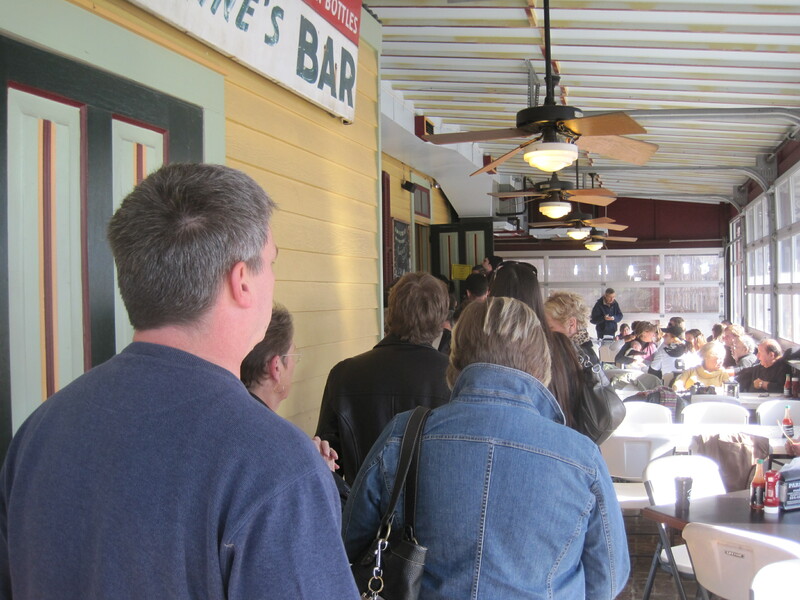 And after nearly being killed by a road rage special just outside of Beaumont (someone passing on the right on an Interstate when my car was on the right), we stopped outside of Lafayette, and in the morning, had breakfast at Cafe des Amis in Breaux Bridge LA. The meal went over well. 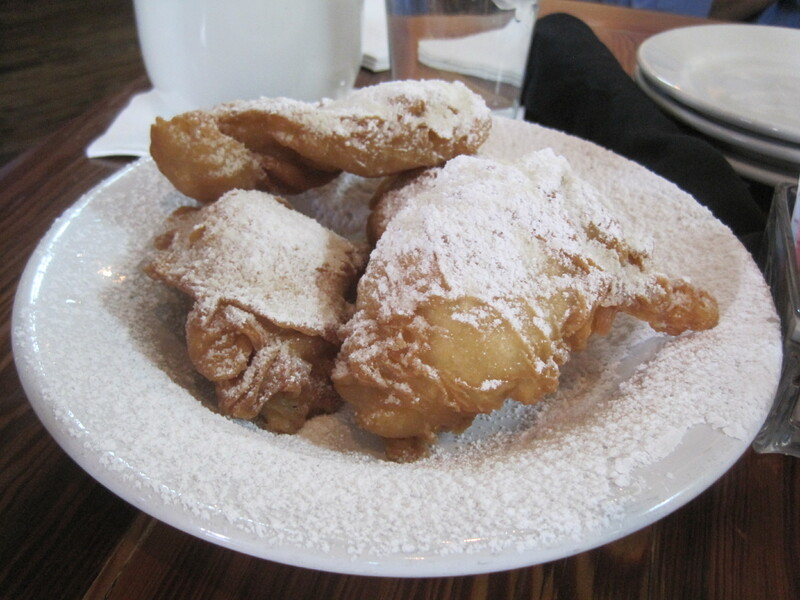 It started with beignets. Wife and daughter loved the beignets. 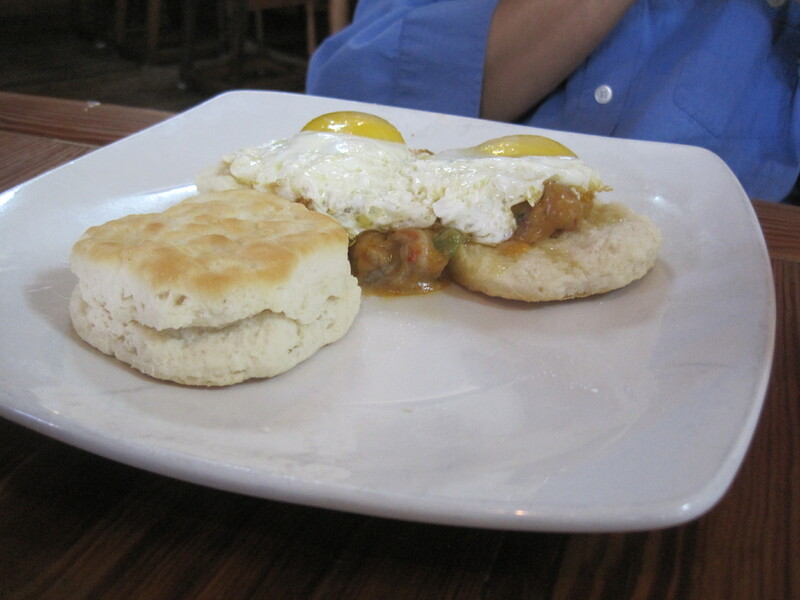 The mix of eggs and etouffee in the “Eggs des Amis” was something my wife could really get into, and I was appreciative of the mix their “Bit Hat” provided. This was easily our best meal of the trip, and my wife hugged our waitress by the time we left. Eggs des Amis. Etouffee is peeking out from under the eggs. 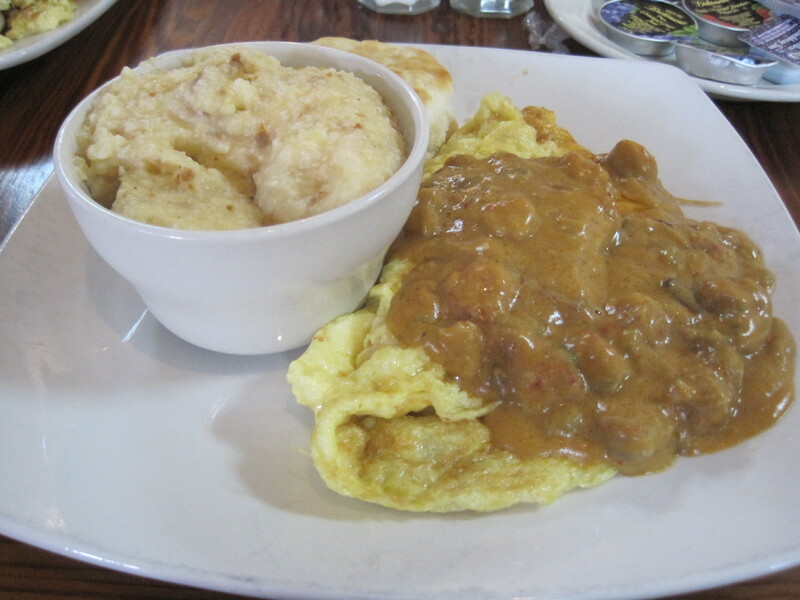 Big hat (omelette and etouffee) with some andouille grits. Seen on the way to New Orleans. 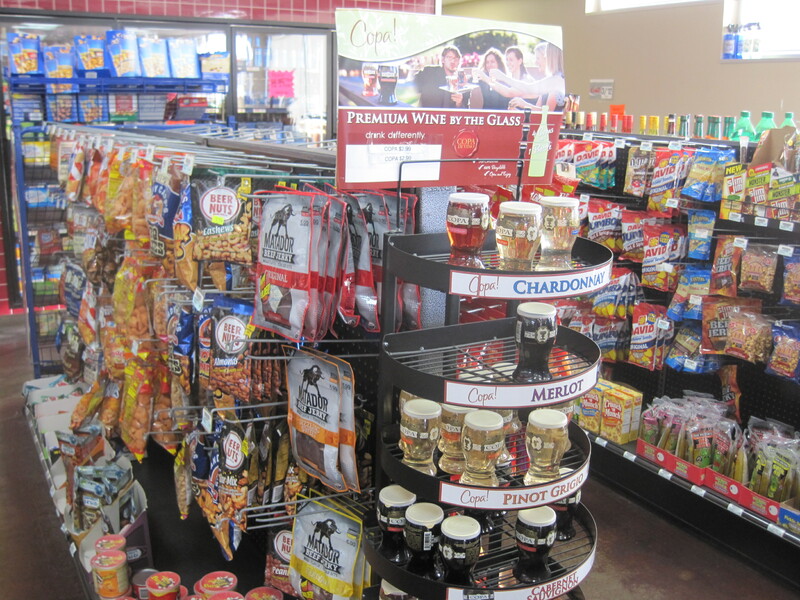 Wine by the glass? The problem was, we had to get in, eat, and get out fast. And in what was perhaps a mistake, we chose Parkway Bakery and Tavern. It was a mistake in part because the path the GPS took us through looked at times like alleys in a miniature Italy. I feared for the safety of our tires. It was a mistake, in part, because we arrived in the middle of a Carolina – New Orleans football game, and the crowd at the eatery to watch football was huge. 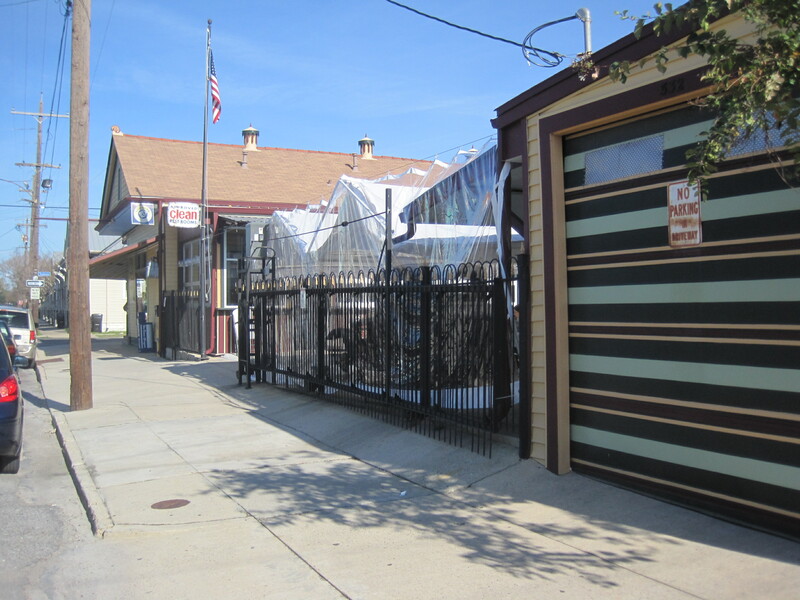 Side of the eatery, showing a lot of the outdoor seating. It’s hard to see, but the body of an old Ford, probably a Model A, is covered in plastic behind the fence. A football game was on and the crowd was substantial. A plaque on the wall (see also this link; dates on link and plaque are slightly different) told the story of the eatery. 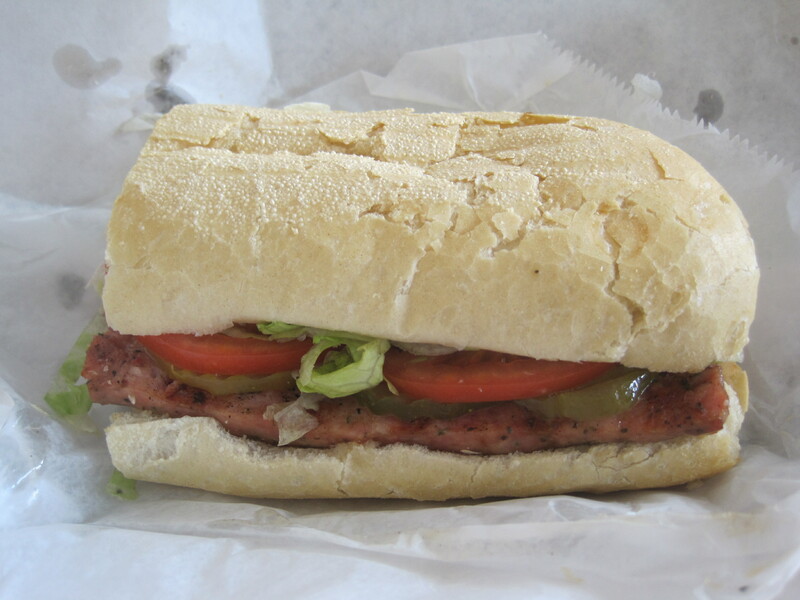 Opened in 1922 as a bakery, it became a sandwich shop in 1932 and has been rebuilt at least once. The meal, once the wait was over, was good. Crusty bread, but softer than what you might get at Paneras (soft bread is actually an old fad, started among the rich). Old fashioned and yet satisfying. Thre sandwiches, fries, banana pudding. Yes, the pudding was really good. Any eating past this point were mere snacks, and frankly, couldn’t compare to the drive. But, oh what a drive it was! *The author of the FCG Barbecue blog is the fella accompanying Tony Bourdain to barbecue joints in the Austin episode of No Reservations. 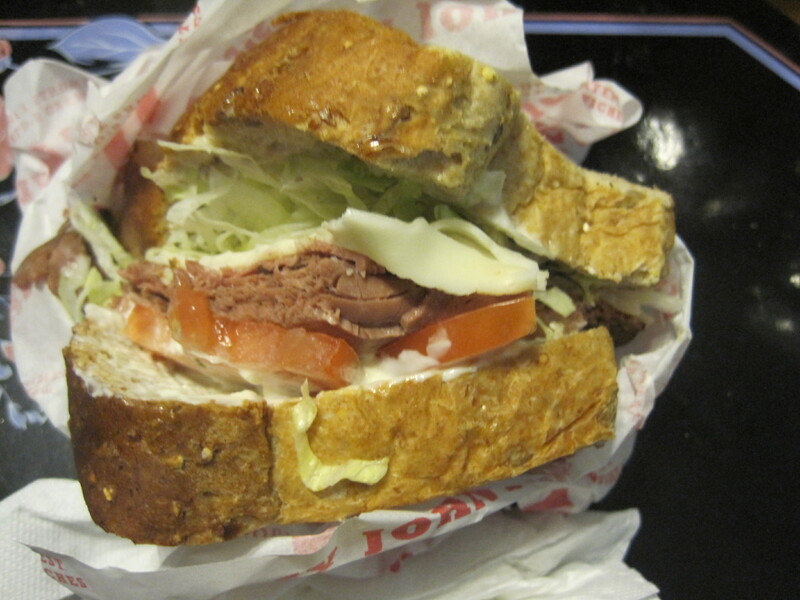 About half a block from the corner of Ronald Reagan and Scenic Highway, across from Publix and Target, near Little Mexico and Gamestop, is a new Jimmy John’s, which takes the place of the now departed Quiznos. 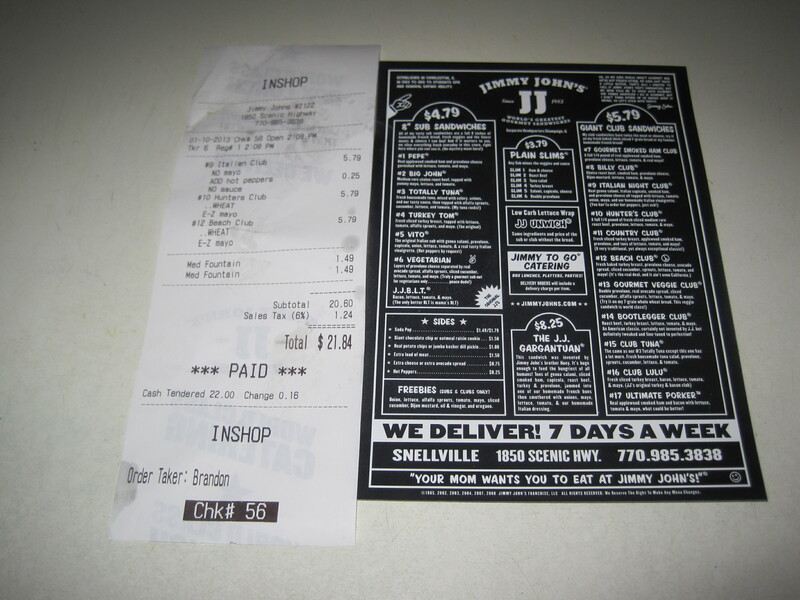 This is a good thing for Snellville, as Jimmy John’s sandwiches at their best approach Atlanta Bread Company and Paneras quality, they are a bit more down to earth, and they deliver. I didn’t know about this location until I was handed a sandwich, a menu, and a ticket. So, pictures of all three follow. The thick Texas Toast style bread really does set off these sandwiches, though diabetics should be alert to the sheer number of carbs in a single slice of this bread. That said, I’m glad it’s in the area, and I wonder how wide their delivery radius will be. It’s a seafood market mostly. It has a couple tables and it will cook seafood for you, for a fee. In this it greatly resembles New Orleans Seafood on Pleasant Hill. 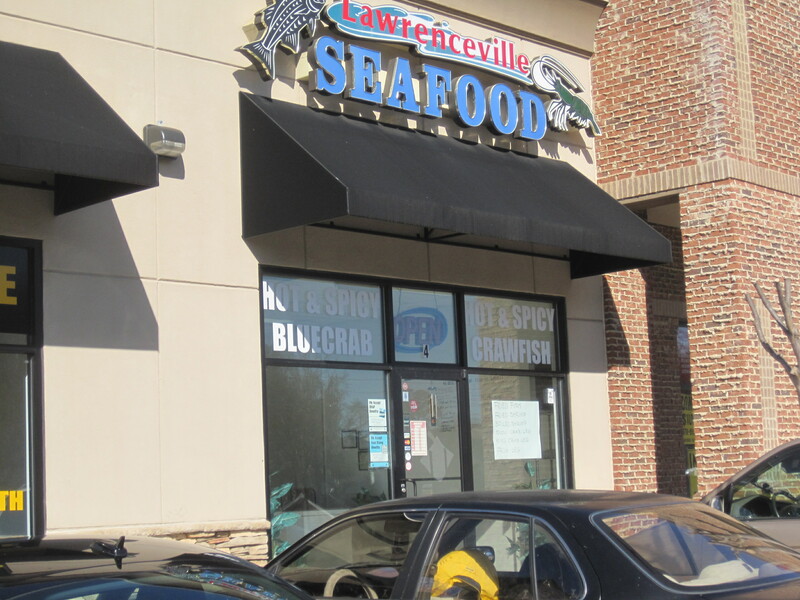 Lawrenceville Seafood is just a little smaller, the crawfish are a little less spicy, and the eatery is closer to those of us near Lawrenceville. 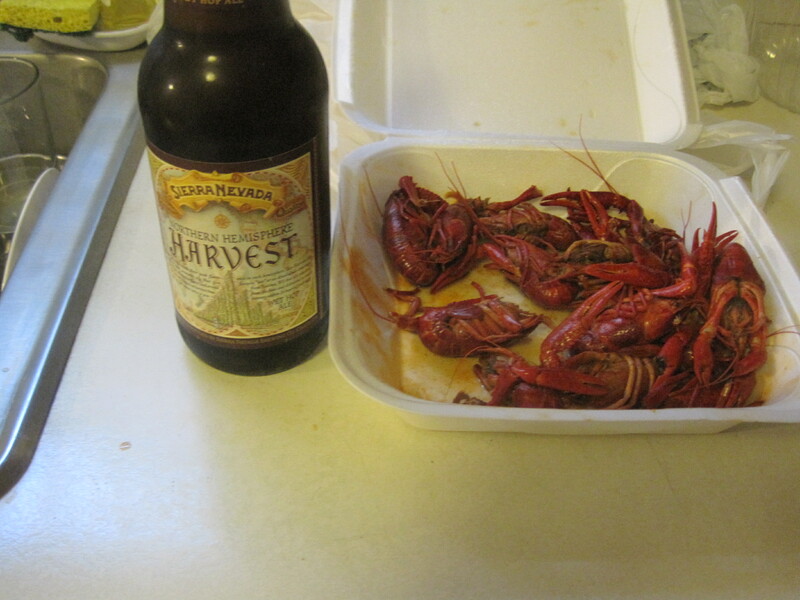 My daughter and I had some of their crawfish for lunch recently. Good stuff. Not a bad place if you’re wanting something spicy to take home to the missus. Two things to note: like many bloggers, I’m going through a period of not being able to write. I have trouble writing anything, much less anything short. But I’ve decided if I write something short and sweet, the longer works will happen. 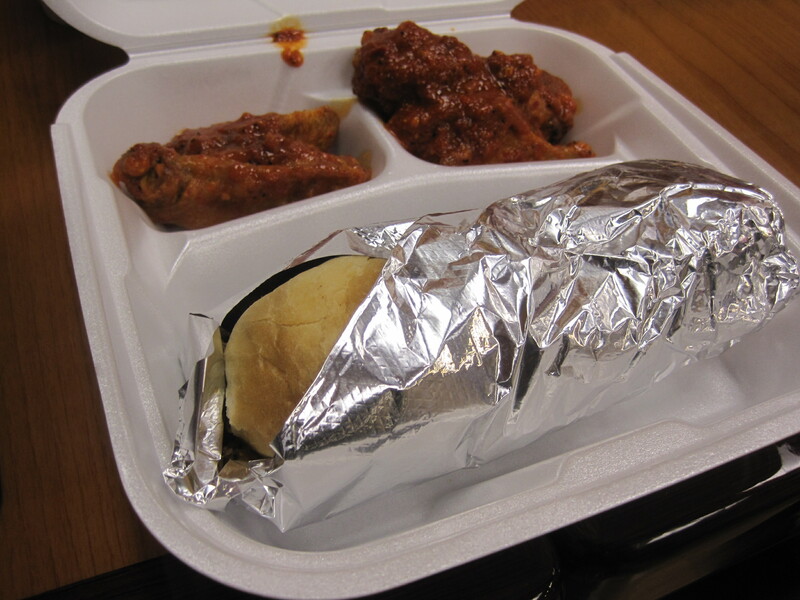 So this short article is about the deli combo at Crazy Wings. Deli combo, Philly Steak with 5 excellent wings. 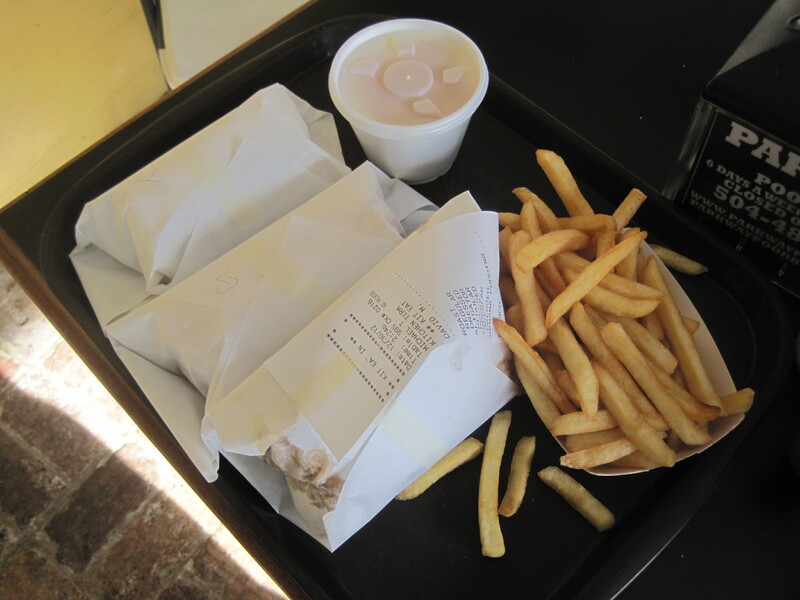 A combo at these places is usually fries, a drink, and a main dish. But Crazy Wing’s deli combo is a main dish, a drink, and 5 of their wings. And that’s important, because they have a notably good hot wings sauce, one made with finely ground ingredients, not ones blended until they are smooth. That means that the bite of the crushed ground pepper, the bits of onion and garlic, tiny bits of tomato, really come through. I like it. I find myself stopping here more and more often, trying more of their menu, just to get a taste of their wings. 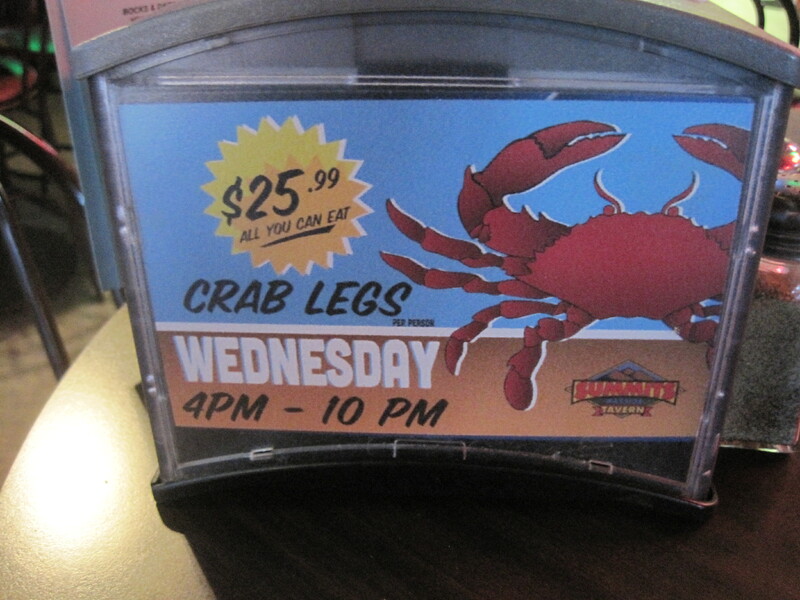 The things you learn about eateries you thought you understood. Lobster House, in Duluth, a bright light show of an eatery, closed over the cold months. It opened at about the same time as Golden House, just down the road on Pleasant Hill. I only went once, when they had a junior chef who was having issues, and was never willing to write a review of the place. I am hoping staff get a chance (with a better chef, and a better restaurant) to show what they were able to do.